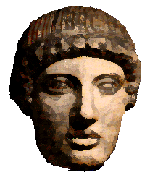 From here you can access a variety of Games and Quizzes on the Classics Pages. The Really Hard Classics Quiz is back - 25 questions on classical subjects against the clock. The questions are selected at random from a pool of hundreds - no two quizzes will ever be the same. If you pass (90% required) you will be eligible for the coveted Classics Pages Dipoma, widely considered the equivalent of a First in Greats. Retakes are allowed. A certificate has yet to be awarded to a Johnson, B or Gove, M.
If (like me) you have a slow connection, it may take a few minutes to load up - once the picture of Oedipus and the Sphinx appears, you are almost there! Good Luck! Click here to start. A very old favourite - it's considerably older than the Classics Pages, but still extremely popular. You adopt a character from the Odyssey (Odysseus, Telemachus or Penelope) and try to follow their adventures. A more complex game, which involves answering over 200 questions. You identify with a variety of characters as you attempt to show off your knowledge of the Iliad. Recently (April 2011) completely revised. The most popular thing on the Classics Pages. A very testing series of multiple choice questions, which can stretch even those who think they know the play well. A timer is provided so you can tell how long you took to complete. A visual game where you try to piece together the sequence of events in Sophocles' play. A picture-based exploration of the tragedy. Explore one of Aristophanes' funniest comedies by choosing the correct image as you progress. How much do you really know about the ancient Olympics? An illustrated guide to the basics of Greek Architecture in the form of a quiz. An interactive web game based on Euripides' Bacchae. Throughout The Romans site there are quizzes - some easy some harder - that you can use to test how well you've absorbed the material.